Twitter : Follow @liverpoolcsd on Twitter for updates and alerts in real time. CSD blog : Follow the blog for news, features, projects and our views on IT developments. Sign up for email alerts to receive our regular updates and latest news. 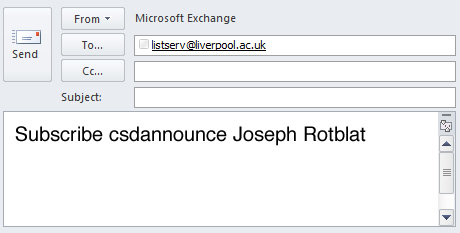 Email listserv@liverpool.ac.uk including the text Subscribe csdannounce FirstName LastName. Reminder: All users of University IT facilities must ensure they comply with the Regulations. The full Regulations, as well as a summary are available, alongside related policies and codes of practice.